There is no doubt that the events of 2017 will have a lasting impact on CARICOM states. The ravaging effects of this year’s hurricane season will cast a long shadow over the community for some time yet. In his end-of-year message, Secretary-General Irwin LaRocque recounted that six of the members and several Caribbean neighbours experienced the wrath of unprecedented back-to-back Category 5 Hurricanes Irma and Maria. The official noted that the Caribbean Disaster Emergency Management Agency, (CDEMA) the community’s specialised institution, performed magnificently as it coordinated the relief efforts and helped to set the stage for recovery. The Caribbean Catastrophe Risk Insurance Facility (CCRIF) was also prompt in meeting its commitments to the affected countries with the appropriate policies. “The climatic events that we have been enduring, whether floods, droughts or storms, have become our new normal. We are living climate change. The recovery and reconstruction phase is underway with an emphasis on building resilience in our community to withstand the expected onslaught of more intense and frequent storms powered by the effects of climate change. 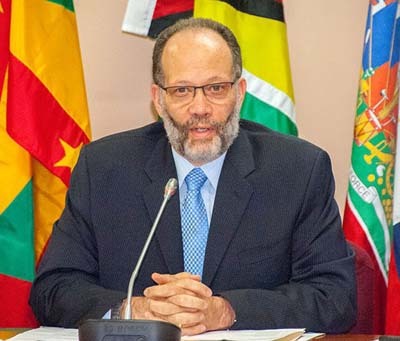 Given the magnitude of the damage caused by the hurricanes, the region cannot rebuild without the support of the international community,” La Rocque said in a statement released yesterday. Last month, in collaboration with the United Nations Development Programme (UNDP), the region sought their assistance at the CARICOM-UN High Level Pledging Conference – “Building a More Climate-Resilient Community”. The process of ensuring that the financial and technical assistance offered there will reach the affected countries is in train. However, the Secretary-General bemoaned the lack of developmental financing. He explained that classification of most of the member states as middle to high income countries denies them access to such funding. Significant advances were also made in the past year, particularly in regard to human resource development and energy. In July, Heads of Government received and endorsed the Human Resource Development 2030 Strategy. The strategy was drawn up in recognition of the imperative for a radically reformed system to address the requirements of 21st century economy and society. It outlines actions for basic education, from early childhood through secondary, the tertiary sector and life-long learning. Also in July 2017, member states signed the agreement establishing the Caribbean Centre for Renewable Energy and Energy Efficiency (CCREEE). The centre is based in Barbados and is the implementation hub for sustainable energy activities and projects within the region. The Strategic Plan for the period 2015-2019 identified energy as a key driver in the pursuit of economic and climate resilience building within the region. The centre, the Secretary-General explained, will play a major role in the Community’s thrust to increase the renewable energy share in power generation to 47 percent by 2027, with the resulting lowering of costs to the consumers and benefits to the environment. “We were able to expand opportunities for our private sector with the signing of the Second Protocol to the CARICOM-Cuba Trade and Economic Cooperation Agreement. This protocol allows for duty free access to Cuba for CARICOM producers, of approximately three hundred items which include meat, fish, dairy produce, fruits and vegetables, beer, rum, cement, soaps, articles of apparel and clothing. “The enthusiasm for the cultural extravaganza was not dampened by the threat of Hurricane Harvey as the people of the Caribbean showcased their creativity at various venues across the island. The business aspect of the creative industries took centre stage in keeping with the Heads of Government endorsement for exploring the potential of the cultural and creative industries to contribute to the economic development of the region. LaRocque noted that as the year ends, the region is just past the midway point of its Strategic Plan and in the final stages of making the transition to a Results-Based Management System for the community. CARICOM is a grouping of 20 countries: 15 member states and five Associate Members. It is home to approximately 16 million citizens. CARICOM came into being on 4 July 1973 with the signing of the Treaty of Chaguaramas by Prime Ministers Errol Barrow for Barbados, Forbes Burnham for Guyana, Michael Manley for Jamaica and Eric Williams for Trinidad and Tobago. The Treaty was later revised in 2002 to allow for the eventual establishment of a single market and a single economy.